Blindsided by Caregiving You Need a Contract! Did you know you can stop a hospital from discharging someone to an inappropriate facility? If your loved one is given an incorrect diagnosis, this is an all-too frequent occurrence. Recently, I had a client contact me because her husband was being sent to dementia locked unit in a nursing home. Her husband was actually experiencing delirium, not dementia! He had fallen off a ladder putting up Christmas decorations and shattered his elbow. He had an adverse mental reaction to the anesthesia and began to spiral downhill. Her husband became delirious and combative, and was given psychiatric medications. As a result, he experienced dementia-like symptoms. Delirium is defined as an acute confusional state that usually goes away after a period of time. Many elderly patients suffer from delirium while in a hospital as a reaction to medication, sleep disruption and unfamiliarity with their surroundings. Dementia is a more permanent state of confusion usually caused by something physiological, such as head injuries, stroke, poor circulation and or plaque growing in the brain. I had my client appeal the discharge, and she won her appeal. We were then able to get her husband into the proper facility for the proper treatment and rehabilitation. 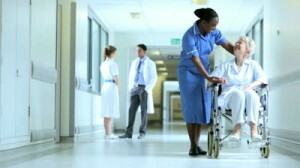 If you need assistance with a hospital discharge, contact us today!